It was inevitable that once we started talking into mobile phones, we’d want to talk to them as well. Now, thanks to Dragon NaturallySpeaking, you can have your phone or other mobile device take over the pesky task of typing notes. 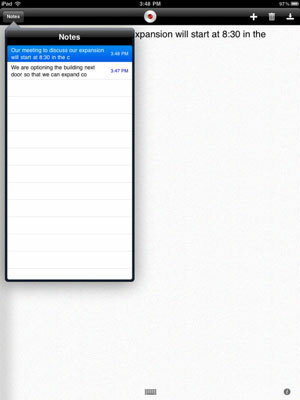 1With the Dragon Dictation app open on your iPad, tap the Notes button on the upper-left corner of the screen. You see a split screen. On one side, you see your list of notes. On the other is the dictation of your last note, as shown. You see that your dictation is recorded and will be in your list of notes until you either delete it or do something else with it. 3Tap the plus sign (+) again when you are done. With the Notes app, you can record and save passages of text, send them as an e-mail, or post to a social network. Notes you dictate are automatically saved and put in your notes list. To manually delete a note, use the Trash icon. Your note will also be deleted if you send it as an e-mail or Cut it.